In today’s business environment, information and innovation are key to success. Companies are constantly trying to improve their offerings and business model by increasing their knowledge about customers, competitors, products, services and new technologies. To achieve this open innovation practises are increasingly used, but a major part of the knowledge in companies is generated by individuals who do research to generate new ideas and capture opportunities. This required know-how can be sourced from within the company or from external sources. Nowadays, individuals performing R&D functions are encouraged to seek for knowledge outside the boundaries of the firm. This requires more openness to external sources. However, according Salter et al. 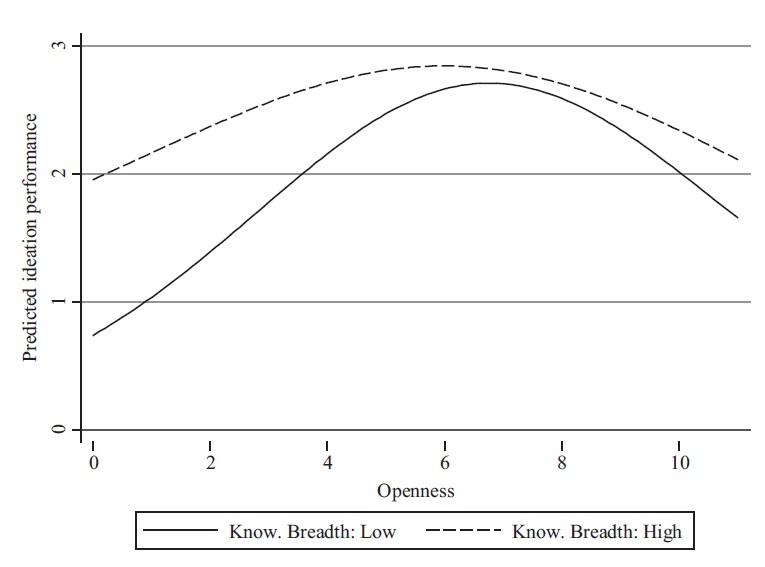 (2015) an individual’s openness to external sources of knowledge is curvilinear related to the ability of that individual to develop new and useful ideas for the organization (e.g. ideation performance). External knowledge is not superior to internal knowledge, but definitely beneficial. Using external knowledge sources results in information richness and provides unique perspectives. New markets or opportunities are more easily recognized as external knowledge can be combined with internal knowledge resulting in innovative ideas. Individuals relying solely on individual sources or only on a few external sources have fewer opportunities to come up with novel valuable ideas. 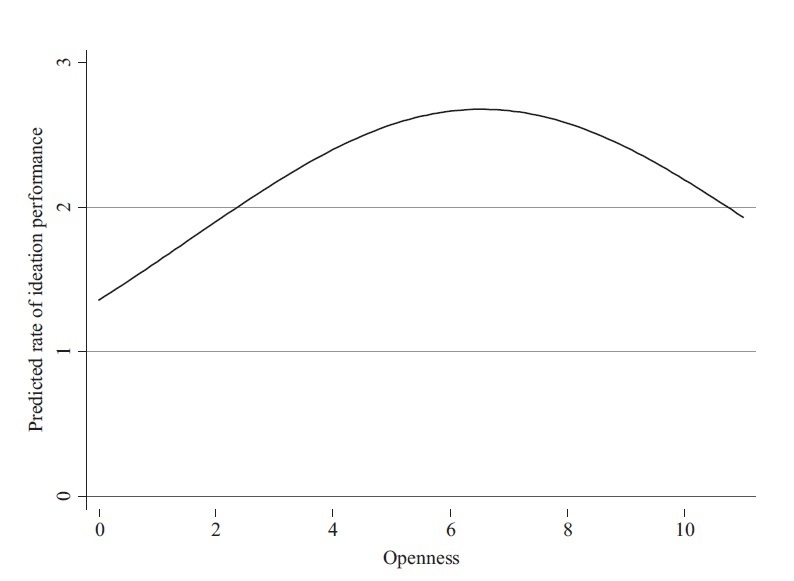 Nonetheless, there is a point when the consequences of increasing the number of external sources in R&D can lead towards diminishing ideation performance or even negative returns: as the number of sources increases it becomes more difficult to process all the information and get approval for exchange of ideas with external sources. This results in higher coordination costs. The authors found that individuals who used multiple external sources had a higher chance of their ideas entering the implementation phase. However, these effect starts to become negative when fewer than five or more than nine six external sources are used. 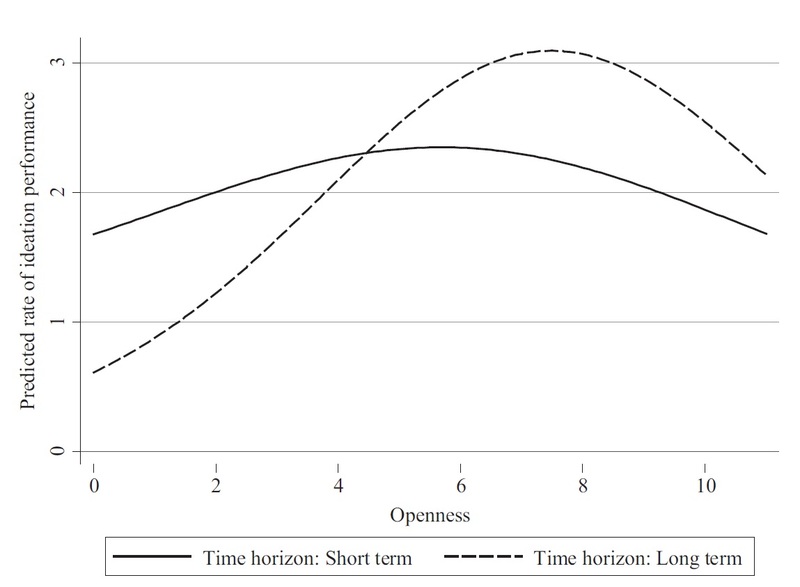 Furthermore, they found that the time horizon of R&D moderates the effect of openness to external sources on ideation performance. A long term focus is better as it provides researchers with more time to process and get access to the external sources. Also a more diversified knowledge background in combination with openness to external sources enhances ideation performance as researchers with a high knowledge bread are better able to understand, process and combine information from a variety of external sources. It is clear that external knowledge and open innovation are beneficial to come up with useful ideas. Thus, besides internal knowledge companies should use external knowledge in R&D projects. However, there is an optimum before negative returns come at play. A good example is FedEx, who wanted to ensure on-time, zero-defect delivery of organ donations. To come up with ideas and develop a solution their R&D researchers used information from external medical experts and suppliers. Combining external medical knowledge from multiple sources with internal logistic know-how they developed a logistics technology which perfectly managed variables such as location, temperature and pressure. Using too much sources might have partially caused the failure of Coca-Cola’s Freestyle beverage machine. The drinks and recipes created by customers were not successful and Coca-cola was unable to combine all data into “the perfect drink”.